Auditions for the Elgin-produced musical are open to the public and will be held 7 – 9:30 pm on May 16, 17 and 18, 2016, at The Hemmens Cultural Center, 45 Symphony Way in Elgin. 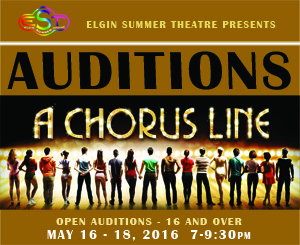 To register for auditions, go to the Elgin Summer Theatre link at www.hemmens.org. EST is a showcase for regional talent and is funded through a grant from the Elgin Cultural Arts Commission and the City of Elgin. Show times are 8 pm July 15, 16, 22 and 23, with 3 pm matinees on July 18 and 24. $15 – $20 reserved seating. Tickets are available at The Hemmens Box Office, by phone at 847-931-5900 or by going to www.hemmens.org.